Yes, I think I have a decent sequence but I need to find the time to finish the drawings. I also want to put it into a historical context of what came before and how it evolved after so you can see where the progression is going. There was a lot of variation and evolution of insignia around the junior commissioned / warrant / senior rate insignia from the mid/late-19th Century to early-20th Century with changes occurring every few years at one point! Things like distinction lace and cuff buttons were constant features but their exact significance and assignation varied somewhat. The three horizontal cuff buttons were originally features of officer uniforms and, on their own, the distinction mark of Warrant Officers before being extended first to Chief Engine Room Artificers and then to all CPOs. Orignially CPOs wore two small buttons vertically on the outer edge of the cuff. In time, the three horizontal buttons were subsequently removed from the uniforms of first commissioned officers and then Warrant Officers but ultimately retained for CPO. By WW2, all RN WO would wear the quarter-inch distinction lace, without buttons, which was originally the mark assigned to those with over ten years seniority. Commissioned Officers from Warrant Rank would wear standard half-inch lace alongside sub-lieutenants. Interestingly, contemporary rank equivalence charts of the time fudge this by listing Warrant Officers, RN with Army warrant officers but specifically have notes that the naval WOs are held to be senior to all other WOs from the Army and RAF. 1. Old-style Warrant Officers, descended from the "standing officers" of sailing ships, who held Admiralty warrants but were nevertheless Officers, will be merged into a unified structure of officer ranks who all hold commissions and whose distinguishing insignia is gold cuff (or shoulder) distinction lace (much as per real history — in the end, it's the only obvious solution). The course of this evolution, however, is somewhat different within my alternative hypothetical history and the status and role of Warrant Officers on my version becomes somewhat more developed than the Royal Navy allowed for in real history. 2. The Chief Petty Officer rate will (eventually) be advanced and expanded to fill the senior NCO role, equivalent to the Army and RAF WO1 and WO2, but retaining the historical link of the old "warrant officer" cuff buttons for CPOs. The initial change to nominally equate the CPO rate to Army WO3 rank would have a historical context of the Admiralty wishing to maintain parity of their senior rate with senior Army NCOs, but having this complicated by the already existing naval Warrant Officers. This is why the navy later chooses to place two grades of CPO in this position and avoids re-establishing naval "warrant officers." When the WO3 rank is placed in abeyance, the CPO rate will become equivalent to WO2. After the existing Warrant Officers are merged into the commissioned career path, the rate will later be split into two classes, with the new CPO, First Class acquiring insignia that mark its equivalence to other WO1s. That's also why, when I began to play with the RN WO grades, I also included the re-introduction of PO1 and PO2, and their re-alignment to equate them to Staff/Colour/Flight Sgt. and Sergeant, respectively. Hence, ultimately, PO rates = sergeants, CPO rates = WOs. CPO2: smaller version of the old CPO arm badge (Crown / anchor / wreath) above the three buttons. Both grades of CPO will continue to wear the existing CPO cap badge. Both grades of PO will continue to wear the existing PO cap badge. All of these senior rates will wear fore-and-aft rig with three rows of buttons on the jacket; POs will wear specialty marks (non-substantive badges) on the right sleeve, CPO2 will wear small specialty marks on the jacket collars and CPO1 will not wear specialty marks. Leading Rates and below will (eventually) all move into "square-rig" and the old Class III uniform will be discontinued, although it will initially be retained for some purely non-operational administrative roles. Leading Rates will also keep their established anchor and cable insignia but when a standardised career pathway is established to achieve direct parity across all the services, they will acquire a star above their anchor and a new rate for senior ABs will inherit the single anchor, finally ending one of the longest historical associations of one insignia with a specific rank. In later times, the junior rates will wear a distinctive metal beret badge (perhaps not unlike the brass badge of the class III uniforms, from the posts above) where POs and CPOs will wear smaller, embroidered versions of their standard cap badges (as will officers). For working dress, the insignia of the most junior rates would be embroidered in red on blue slides whereas those of the senior rates would be embroidered in synthetic gold thread. Thus it should be simple enough to distinguish between the crown and anchor of a PO2 and the star and anchor of a leading rate. I'm not sure how gorget patches for the Navy would work but, potentially, I guess they could echo the decoration on the collars of the old dress uniforms, with oak leaf and acorn decoration for flag officers, gold lace for senior officers and narrower gold lace for junior officers, leading to the existing plain white turnback patch with simple white cord twist for Midshipmen. What did you have in mind...? As for the Lord High Admiral, like I said above, I already have the designs. I used something like you describe but I used it for the centre of the cap badge in place of the silver foul anchor; I used an ovel of crimson velvet, with a gold roped edge, and the fouled anchor emblem from the flag. A larger version of this badge, fully surrounded by a sliver laurel wreath, would be worn on the gold-faced ceremonial shoulderboards in place of the sliver anchor and wreath for the Grand Admiral. The crossed batons would change from dark blue to crimson. Buttons would look like flag officer buttons but would exchange the RN crown-and-anchor for the LAH double-fouled anchor alone. The crimson from the flag could also be used as a subtle accent colour for other uniform accessories (e.g. the morocco leather of the dress sword belt) but probably not between the distinction lace at the cuffs as it would look a little too much like the scarlet worn by medical officers. I decided not to use it as the backing colour for the gold-faced dress shoulder boards for the same reason. The distinction lace would also incorporate some of the elements of the Grand Admiral insignia but this varied a little as I had two different versions of the LAH insignia and uniforms: one for the hypothetical alternative history and a different version that might just work as a contemporary version for the Duke of Edinburgh. There are also insignia for the associated honorary ceremonial roles of Vice-Admiral of the United Kingdom and Rear-Admiral of the United Kingdom (not associated with the usual RN substantive flag ranks of Vice-Admiral and Rear Admiral). When I have the time, I'll post the pics for all of these. I'm looking forward to these up coming pictures. What I had in mind for the Gorget patches was that the colours wouldn't be the same as the Army ones for a start, but instead mostly like the branch colours with a few exceptions. with Midshipman and Cadet staying the same. This would also be linked to the collars of the Full Dress as well (which I would do slightly differently than you have done). I feel a bit stupid really as I could draw better what i mean but i haven't got the programs to draw it well. I think I have a fair idea what you mean. Compared to what we're used to, they'll probably look a little odd on the current No.1 monkey jackets, but they might perhaps have worked on the frock coats of the late-19th / early 20th Centuries, as lesser forms of the collar decoration from the full dress coats. Just a quick look at the full dress coats for the Grand Admiral (as First Sea Lord and professional head of the RN) and then the Lord High Admiral (as the ceremonial head of the Naval Service). The Grand Admiral wears the star, badge and broad ribbon of the Order of the Bath; the Lord High Admiral wears the neck badge of the Order of Merit and the breast star and broad ribbon of the Order of the Garter as well as star of the Order of the Bath. Both appointments also wear full First Class aguillettes. Note the variation on the cap badge and the change of buttons for the Lord High Admiral from the standard RN flag officer buttons; the same change is also made to the belt buckle plate. The crown is omitted in favour of the simple fouled anchor which is a recgnised historic symbol in its own right. Also the use of crimson for some of the uniform details -- although I'm still rather undecided about the crimson collar and the use of the small LAH fouled anchors on a crimson circle inside the curl of the sleeve distinction lace. The use of the white-topped peaked cap is probably slightly anachronistic for the 1920s where the LAH and GA are likely to continue to wear cocked hats when in full dress (at least initially) but it allows me to show you the cap badges (!). I guess this version might possibly be seen in the late-30s rather than early-20s, at least within the alternative history! In truth, I don't think we'd ever see such a uniform for all the reasons discussed in the posts above but it was fun to draw it. This was the design for something that might work for the Duke of Edinburgh as Lord High Admiral; it's slightly different in that it is based on the current RN Flag Officers' ceremonial day coat and has different sleeve distinction lace. The badges and the shoulder boards are essentially the same but with the historic Tudor crown replaced with the current St Edward's Crown. The cuff distinction insignia also uses rows of oak leaves in place of some of the gold distinction lace but the pattern is different: given that the broader upper row of 1" lace was only from the hypothetical alternative timeline, I thought that the best way might be to adapt the existing insignia for Admiral of the Fleet. The most obvious way to do this was to replace some of the plain lace with oak leaves so that the rows alternate between the two and therefore the upper row is the standard flag officer 14mm lace with 50mm diameter curl. I considered the option of placing crimson behind the lace and oakleaves and it works quite well bu still looks a little too much like the scarlet "lights" of medical officers. I also considered using the crimson for the coat's collar and this also works OK but without the overlying oakleaves, it generally seemed to look better to keep the plain white collar which also helps to bring the white of the cap into the overall desing. Final note: yes, I know, this is not a direct representation of Prince Philip's decorations and awards. These are just there to give the general impression...! On the whole, this seems to work and represents a subtle upgrade of the existing Admiral of the Fleet insignia, rather than wholesale change. The cuff lace will also work perfectly well on a standard No.1 monkey jacket. Yes, I agree: the Military Division of the Order of Merit does indeed have crossed swords incorporated into its badge but there are currently no appointees within that branch. The Duke of Edinburgh wears the civilian version of the Order's insignia. On the other hand, it probably *would* be appropriate for the late 1930s version in my previous post, depending on who might have held such a post at the time. With some minor legislative amendments, I guess it would have been possible for the Board of Admiralty to continue to exercise the powers of the role whilst an individual was appointed to the title in an honorary ceremonial capacity. Just for you, here's a slightly different version of the contemporary LAH dress uniform, this one has the crimson collar I mentioned and gold fouled anchors on each side that echo the flag. For comparison, it's next to the ceremonial day coat of a contemprary Admiral as 1SL/CNS. And finally, the insigbnia for the other associated honorary ceremonial appointments of Vice-Admiral of the United Kingdom and Rear Admiral of the United Kingdom. The sleeve distinction lace has been deliberately chosen to suggest those of the RN substantive flag ranks of Vice-Admiral and Rear Admiral -- but without following them exactly, so that these are clearly different. The loop above the oakleaves for the RAUK is in the usual 14mm gold lace but is of the same 50mm diameter as flag officers' curls, rather than the 45mm of loop for Commodores, which matches the curls of all other officers. The cuff lace would be the same for both day coats and the No.1 monkey jacket. The shoulder board insignia for the day coats follow a pattern after the LAH insignia but are deliberately NOT the same as those of the RN ranks. The caps would be worn with the standard flag officer two rows of oakleaves and the LAH version of the cap badge. Only the LAH would have the oakleaf pattern embroidery on the sword belt; the others would also be crimson morocco leather and would use the same buckle but would have the more usual three rows of plain gold embroidery. If day coats were to have crimson collars then only the LAH would wear his fouled anchor insignia, the others would be plain. If day coats were to have white collars, as per standard flag officer day coats, then no insignia would be worn. I guess if only the LAH were to have the uniform then maybe the white collar would be better, whereas if all three appointments were to be given ceremonial dress then maybe the crimson collars would make more sense. A little while back, Sketor asked about the possibility of uniforms and insignia for the Metropolitan Police in Londan in this timeline, which I have to admit I hadn't really thought about before! The top row is the early cap badges; the bullion crown & wreath is for "chief officer" ranks and the silver badge with the crimson velvet backing behind the crown is for Superintendents and Inspectors (in military terms, the "officer" ranks) and the dull finish one-piece badge is for sergeants and constables. The bottom row would be later versions of the same set. The large metal plate badge on the left is the "helmet star" from the front of the traditional constables' "Custodian" helmet and the large version on the right would be the official badge used on signage etc. In the middle are the one-piece metal shoulder-titles and the standard uniform button. I figure that the original intention (from the inception of the police in the UK) of keeping police uniforms different to military uniforms is a sound idea, so I figured that the police generally would be reluctant to change and move away from their established insignia so I ultimately stuck with this version which uses some bits of the old Met Police structure from pre-WW2 and ads a few other twists. There are, overall, more individual grades but I figure there would probably be fewer people in each grade. The role of Clerk Sergeant (a real historical Met Police rank which had insignia same as Station Sgt.) is kind of a non-operational administrative role for long-serving senior sergeants prior to retirement, so I've separated it out and given it a different insignia like an Army WO2. In practice, it carries no additional operational authority than a Station Sergeant. Sub-inspector would usually be either an acting rank for a sergeant temporarily fulfilling a more senior role or a probationary position pending confirmation of substantive appointment as a Station Inspector. The only exceptions to this would be some special service units where Sub-Inspector would be a substantive rank. The significance of this is that UK law allows police officers of certain ranks specific additional powers over those of a normal constable, for example the authority to detain a suspect for a longer period of time. These are the general day-to-day working uniforms. Constables and Sergeants retain the older-style closed, high-collar tunic but have more practical buttoned breast pockets and flaped hip pockets. Inspectors and above wear four-pocket open-collar belted jackets with a collar and tie. The now ubiquitous black-and-white diced cap band of the UK police will not be introduced for many years so peaked caps (when worn) are plain dark blue for constables and sergeants and have a black hatband of oakleaf pattern lace for inspectors and above, as well as peak embroidery. The custodian helmet will remain the usual headwear for constables and sergeants on patrol duties. An open-collar jacket, worn with a pale blue shirt and tie, will be introduced first for Divisional Clerk Sergeants and later will replace the high-collar working jacket as the standard uniform for all sergeants and constables. This has always existed for some senior grades within the Metropolitan Police and is worn on formal State occasions. Here, I've extrapolated this to all ranks so that the police outside the Royal palaces and Parliament can get just as dressed up as the Guards when the occasion demands (!). The tunic for sergeants and constables has a similar high-collar and seven button fron as the working jacket but is a pocketless formal tunic, based (loosely) on the older Victorian version of their uniform. The ceremonial dress for inspectors and superintendents has a blue jacket decorated with black mohair frogging (yes, it's a but more military looking...) and all-black silk embroidery for inspectors and silver bullion for suerintendents. Cuffs are peaked with small black lace Austrian knot decoration. Inspectors have plain blue collar and cuffs with black lace and knot; Chief Inspectors and Superintendents (and above) have black velvet collars and cuffs with black lace edging and silver bullion ebroidery. More senior officers have gauntlet-style cuffs with silver bullion details and bullion edging to epaulettes. The ranks of Assistant Commissioner (equivalent rank and insignia to a Chief Constable heading a smaller County police force in the UK) and Deputy commissioner have oakleaves on the cuff and all around the collar. The tunic has a silver buttoned front and is worn with a silver and blue waist sash. The Commissioner has more extensive oak-leaf embroidery, broadly similar to that of an Army general. Like the Army and the Royal Navy, the historical uniform for senior officers inluded a full cocked had with feather plumes - this is not completely abolished but reserved only for the most formal occasions like Coronations and State Funerals. Finally, here's the equivalent uniform for the ranks of Deputy Assistant Commissioner and Commander. Note the black frogging on the front of the jacket and the detailed Austrian Knots on the cuffs -- very Victorian! Smaller silver oakleaves on the collar though. Yes, these senior officers are still wearing cocked hats with feather plumes into the 21st Century and, unusually, wear swords with full ceremonial dress too! Obviously the Comissioner has far more feathers...! Medic_in_Uniform wrote: A little while back, Sketor asked about the possibility of uniforms and insignia for the Metropolitan Police in Londan in this timeline, which I have to admit I hadn't really thought about before! Outstanding work Medic, you should earn a knighthood for this very nice work, thanks! I must concur with Sketor, excellent job on the police charts - simply amazing! I have a few other bits and pieces that I'm in the process of finishing and should be able to post fairly soon: some Army full dress uniforms for the Royal Artillery, Royal Army Medical Corps, Rifle Brigade and an alternative variant for a different infantry regiment. The details are drawn from the traditional uniforms of a number of british rifle regiments; dark "rifle green" is the main colour, with the usual British scarlet as an accent colour only. Buttons and rank insignia are black and bullion, where worn, is silver rather than gold. Note the two images on the right show differing versions of the colonel uniform; the one on the left of the two has the gold aguillettes and Royal Cyhers of an ADC to the King, and might be worn by a Royal colonel-in-Chief of one of the regiments or a General appointed as Regimental Colonel. The version on the extreme right has the scarlet hat band and badges of an officer of the General Staff, with dispensation to wear the full dress of his old regiment rather than the standard scarlet tunic of General Staff Officers. The various artillery components of the British army are merged in the the overall "Royal Artillery." The titles "Bombardier" and "Lance-Bombardier" replace "Corporal" and "Lance-Corporal" as the junior NCO ranks. For ceremonial purposes, the officers and men of certain units of the previous Royal Horse Artillery retain their frogged cavalry-type uniforms but with detailing amended to match those of the other RA regiments. The gold frogged tunic on the right is for those senior officers and dignitaries appointed as ceremonial Regimental Colonels of the various sub-regiments that comprise the RA. Artillery Officers on the General Staff and General Officers of Artillery (certain specific ceremonial roles have artillery blue rather than the usual scarlet as their dress uniforms). The general officer variant would, for example, be worn by the general holding the ceremonial appointment of "Master Gunner, St James's Park," when on parade in that ceremonial capacity. Finally, for now, a different infantry Regiment of the Line to that shown in the original Army Full Dress images a few pages back. This is for the fictional King's Borsetshire Regiment and the basic scarlet tunic is the same but there are regiment-specific changes, such as the traditional regimental facing colour and the cuff pattern, as well as the cap and collar badges. Like the image of the Rifle Brigade officers, above, this pic shows company and field officers as well as versions of the uniform for colonel and above (as worn by the Regimental Colonel and also officers promoted to the General Staff from, late the Borsetshire Regiment. I don't suppose a youre doing a lancer's uniform are you? I think you could do a really good version of it Medic. To be honest, I guess I just sort of started with the obvious main branches of service and then based them (some more loosely than others) on what had gone before. I've now covered a couple of versions of the line infantry; the general staff; general officers and field marshals; rifle regiments; the artillery; the medical corps. The next on my list was probably the Royal Tank Regiment as I fancied doing something a bit different (but then all-black doesn't show up well in drawings...!). If you hadn't spotted the patterns already, then I'll just point out the basics of what I've tried to incorporate into the designs. The underlying premise is that full dress fell into disuse during and after WW1 and that by the time of its re-introduction in the mid-1920s (in this timeline) the War Office, the CIGS and the General Staff decided to take the opportunity to streamline and update the uniforms — but without completely neutering the idiosyncratic history and traditions so dear to the regiments and corps of the British army. In this timeline, then, the dark blue "Patrol" dress would not therefore evolve into the contemporary "No.1" ceremonial dress currently used by much of the British army, although "blue Patrols" would still be retained as an intermediate optional/prescribable semi-formal undress uniform for officers, WOs and duty senior NCOs in many units. All ranks are transitioning to wearing peaked forage caps as the headwear for dress uniforms (with, potentially, a few minor exceptions such as, perhaps, the RTR). While this seems to discard previous "traditional" patterns of headdress, it must be remembered that uniform hats developed and changed on a regular basis from tricorns and mitre caps to shakos and bicorns (and hence into cocked hats) as well as the busby and bearskin variants of fur hats and any number of different cavalry and infantry helmets, some worn for battle and some purely ceremonial, as well as bonnets, "pill-box" and peaked undress forage caps. Anyway, the point is that change was a constant process and reflected and was influenced by styles of other countries (mainly across Europe). 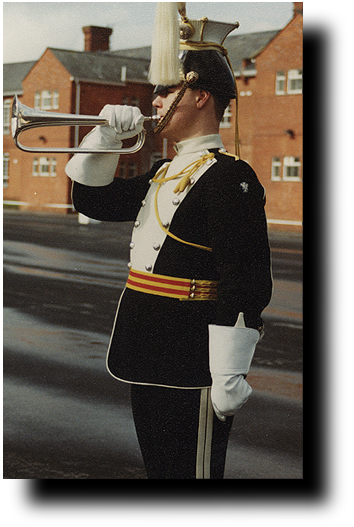 In general, other ranks wear one pattern of cap, usually dark blue with regimental colours to hatband, piping and/or crown piping to match the main uniform and facing colours. They tend to have narrower, slide-buckle chin straps and metal cap badges. Officers may have a variant on the OR cap or may be somewhat different in appearance. They tend to have broader leather chin straps and bullion/embroidered versions of the cap badges with a little more colour. Officers up to Captain wear plain peaks; Field officer of Major and Lt. Colonel rank wear passing peaks with (usually) a band of raised bullon embroidery around the outer edge and officers on the General Staff (Colonel, Brigade Colonel) wear one row of bullion oak leaves with the Royal crest badge of the General Staff. General Officers and Field Marshals wear two rows of oakleaves and their own rank-specific cap badges. For warrant officers, WO1 essentially wear the same pattern as the junior (company-grade) officers while WO2 (and WO3 where used) wear OR pattern but with officer cap badges. 1. flapped and buttoned "slash" cuff with buttonhole decoration and scalloped edge to the flap. Plain cloth (usually in contrast colour) or bullion piped edging above the cuff and around the outer edge of the flap, with increasing decoration to the flap and lace around the top of the cuff below underneath the flap for Warrant Officers and other ranks; bullion and lace on the flaps and increasing rings of bullion around the cuff for Officers: one ring for Second Lieutenant, two rings for Lieutenant and Captain, three rings for Major and Lieutenant Colonel, four rings for Colonel with some variation between regimental appointments and those appointed to the general staff. There is also a version with two rings of bullion, spaced the same as the outer rings of Colonel but with a band of lace filling the full space between them, for Brigade Colonels. General officers and above have bullion oakleaf and acorn embroidery. 2. peaked cuff with single line piped edging and small trefoil / Austrian knot above the point of the peak (some variation by unit as to plain or bullion piping by rank). The same pattern of decorative lace or bullion below the piped upper edge, as above. 3. Gauntlet cuff, also with plain or bullion piped edging and the same pattern of lace or bullion decoration around the upper and outer edge of the gauntlet. The main variants can be seen in the detail drawings of the RAMC and Rifle Brigade cuffs in the posts above. These basic forms would apply to all of the new full dress uniforms. Trousers are usually dark blue and outer leg stripes generally vary from narrow piping for other ranks to various degrees of broader stripes/welts for WO1 and officers and, finally, broad bullion lace with oakleaf pattern for general officers and above. Additional tunic decoration such as button placement or the use of decorative lace or frogging and so on is allowed to follow previously established regimental tradition. Other accessories such as cross-belts, shoulder sashes for sergeants and WO2, sword belts for WO1 and waist sashes for officers will vary by regiment or corps and may completely follow established tradition or may be new and updated but incorporating traditional elements. Formed during WW1 after the development of "the Tank" as a new mechanised weapon of war, the Royal Tank Regiment was originally a branch of the Machine Gun Corps and then became the Tank Corps before becoming the Royal Tank Corps and finally the Royal Tank Regiment in the post-War years. It was a central component of the Royal Armoured Corps as other historic cavalry regiments moved away from horses to become mounted upon mechanised armour. In around 1920, the RTR adopted their famous black beret (being one of the first regiments to do so); it was more practical headwear inside the cramped spaces of a tank and the black didn't show the inevitable oil stains that came from working with the machinery. This practicality later spilled over into black working uniforms for tank crews and, when Full Dress was re-instituted, the RTR (which, as a new regiment, had never previously had its own Full Dress) opted to stick with black as their distinctive colour. RTC and then RTR service dress had originally used black for officers' Sam Browne belts and patent leather peaks and all ranks had used black hat bands on service dress caps. Peaked caps were also part of the initial designs for the new RTR Full Dress uniforms, along with the other other regiments but after the black beret was introduced for working dress, and then accepted as standard regimental headwear for service dress, it was eventually decided by the regimental hierarchy thaty they wished to develop their own unique traditions (like every other regiment in the British army!) and the beret was adopted for ALL orders of dress. Officers of the General Staff and General Officers promoted from the RTR or commanding Armoured Corps and Divisions, could also wear black Sam Browne belts and black peaks to their service dress caps and, later, black berets with their Service Dress or Staff Pattern battledress. General Staff Officers promoted from the RTR and serving with armoured units would sometimes continue to wear black full dress but with unit-specific badges removed and with the addition of General Staff badges and collar and cuff embellishments. Working dress was originally the Army's new standard field service uniformas for other regiments but very quickly tank crews discovered the RAF variant for air crew (later all RAF ranks) the buttons of which fastened behind a placket,preventing them from snagging in confined spaces. As these uniforms were initially produced only in RAF grey-blue, they chose the simple expedient of dyeing them black. Eventually, this unofficial "tank uniform" was recognised and formally adopted and procured, initially by the RTR and later for many of the other new tank regiments too. The WO1 RSM and the Corporal wear standard Battledress in RTR pattern but the Staff Sergeant and the Trooper wear black Tank Crew Battledress. I'm getting tired of paying your work so many compliments. About the Lancer uniforms, I think they could fit into your timeline of simplification and standardisation. It can be a smart yet straight forward rig. And variety can be put on easily by changing the two principle colours. Could even make a tropical version by changing the base colour to white (though this isn't a real variation). An example in a film is the cavalry that have arrived before the credits in the film Zulu (watched it today). Good examples do exist on the internet too. It derives from the Polish Uhlan uniform. A version I like is the 17th/21st Lancers. A dark blue with white plastron and linings. Though I don't think much of the czapka helmets. really bizarre. Could easily be replaced by a peaked cap or pith helmet. They could also easily incorporate your cuffs, thinking particularly of the one with Austrian knot. Yes, I like this idea -- I'll see what I can come up with. I'd like to take a crack at Dragoons, hussars and lancers but that's a heck of a lot of fiddly details to get right, so it might take a while...! I'm not a great fan of the czapka in this context but, given the basic premise I had set myself, then I think it should be possible to come up with something for the lancers along the lines of a peaked dress forage cap using the colours from the tunic, piping and plastron foor the hatband, piping and crown. I have a few ideas in mind! BTW, to anyone who sent me a PM recently: thank you and I *have* replied but I'm not sure the PM system is working fully as they all seem to be stuck in my outbox! Out of interest, what else are you working on these days Medic? To be honest, I'm not doing much else like this right now. I have too many proper work-related things that I have to do at the moment. I enjoy playing around with the drawings and refining the designs though so I still do some as a kind of "down-time" break when I have a few hours (my wife calls it "work-avoidance"...!). The Lancer uniforms are kind of fun and borrow design cues from much later European styles than many other British regiments (so much so that some Lancer full dress barely looked "British" at all!) but that also makes them more interesting too! what could possibly need doing to those? Hi Clive, I guess they just need a little refinement: the lower end of the plastron and the overlap of the front tunic flap needs to be a little narrower and I need to add in the cap cords and cross-belts. That kind of thing. I'm happy with the overall look but I think sorting out those sort of details will just finish them off. The other thing that ocuured to me is that the current "look" with overalls covering short boots would work better with blue patrol jackets (or contemporary No.1) but for full dress they shoul probably also have full below-knee riding boots. I'll try both and see how they look. I also need to add in the piping on the quarter-seams of the cap crown (it's most noticeable on the vertical front seam but is also on the sides and back). All the current No. 1 caps of the contemporary Lancer regiments feature this unique variant of the dress peaked caps -- a nod in the direction of the decorative lace and piping on the four vertical edges of the csapka-style lancer dress caps/helmets. I'll also try some variations on colour-schemes too; maybe red tunic / navy plastron with red caps and yellow (or gold) piping and stripes. There are plenty of historical examples of different coloured full dress varants among the British lancer regiments. As these now happen to be ready, here also are the uniforms for the Corps of Military Police. Note, not yet the Corps of Royal Military Police -- that happened later -- but a merged Corps that incorporated the previous Military Mounted Police and Military Foot Police. The NCO / other ranks version is actually not too different to the historic full dress of the Military Foot Police around the turn of the century, which would have been worn with the infantry version of the home service pattern dress helmet. Obviously here I've paired the uniforms with a dress version of the scarlet-topped cap, in keeping with the general scheme for dress uniforms for all the other regiments that I outlined above. The officer / WO1 version is something of a confection of my own imagination (!). A variant of an older undress uniform worn historically in place of coloured regimental full dress, largely replaced by the khaki service dress. In the contemporary British Army, it forms the basis of the formal "No.1 Dress" which effectively replaced full dress for most regiments after WW2. It is still used by specific units like the Household division for formal wear on some non-parade occasions. Here it reperesents a formal duty uniform for military police undertaking certain specific duties. Note also the unique variant on the senior officers' Home Service Undress dark blue embellished tunic that is specific to the post of Provost Marshal. As an aside, in peace time the Provost Marshal (and professional head of the CMP) here holds the rank of Brigade Colonel and therefore wears the appropriate single row of bullion oak leaves on his dress cap and the associated gold cuff lace on his full dress uniform. He is also entitled to special ADC aguilletes. The deputy provost marshal and chief-of-staff of the Corps would be a full colonel, with assistant provost marshals (and COs of deployable detached units) in the field officer ranks of Lieut. Colonel and Major. In time of general mobilisation, with an increase in the overall size and duties of the corps, the post may be up-graded to general officer status, usually in the rank of Major General. For the most part, the usual general officer uniform would be worn, but when on parade with or formally representing the CMP, the general officer cap badge and two rows of oak leaves would be worn on the CMP scarlet-topped cap and the full general officer-pattern bullion oak leaves would be worn on the scarlet collar and cuffs of the CMP full dress. The usual khaki suit - worn with formal caps; parade version is white belts for other ranks, crimson sashes for senior NCOs (as shown) otherwise polished black belts. Officers / WO1 wear black Sam Brownes. Note the senior staff officers (Provost Marshal and Deputy Provost Marshals) wear the Staff Officer badge (and gorget patches) in place of the Corps badge but still wear the CMP scarlet-topped cap. For less formal barracks wear and when not on formal patrol / policing duties the plain khaki service-dress caps without the scarlet tops may be worn (and for these, the senior officers would have the standard scarlet hat band). The usual Army battledress, which may be worn in Field-pattern or Staff-pattern, according to rank. For most duties a red cover is worn over the top of the standard khaki peaked cap but this may be removed if it would be too conspicuous. CMP do not wear the usual other-ranks khaki side-caps. Officers would frequently not wear the red covers in the field unless undertaking specific policing duties but might still wear the black-on-red "MP" armbands, as required. Away from active combat zones, MPs might wear the white Sam Browne-style pistol belts and white gaiters when on patrol / policing duties (worn here by the WO1). One minor note, the lancer's uniform has two extra buttons next to the collar. Just have a look at the pictures incase my powers of description fail me. Clive19 wrote: One minor note, the lancer's uniform has two extra buttons next to the collar. Just have a look at the pictures incase my powers of description fail me. Yup, you are entirely correct; those additional two buttons fastening the upper edge of the plastron, either side of the collar, would keep the top of the plastron from bowing out. It's just another one of the little things I need to fix, along with adding the additional accoutrements...! Can't really express how much i appreciate your work. I seldom log in but I lurk a lot. How about a general officer's lancer uniform? Is your idea that the red piping is a permanent fixture of lancer uniforms, regardless of regiment?. I thought that piping on british lancer uniforms was of the same colour as the plastron and cuffs? To be honest, the design above was very much a speculative first pass at what I might use but I was aware that it would need some refining, I was simply playing with ideas and using the red piping was just one of those -- although I think it does kind of work. I was toying with the idea of introducing contrast coloured piping (not necessarily red) for all the lancer regimental variations in uniform colours. For example, those regiments with scarlet plastrons on dark blue tunics (5th, 9th, 12th) or dark blue on scarlet (16th) might have had white piping or perhaps yellow (or gold) piping to match their yellow trouser stripes. I actually have much more accurate representations (albeit with collars, cuffs and epaulettes updated to the new "standardisation" for my timeline) for the 5th, 9th, 12th, 16th, 17th and 21st Lancers in their traditional colours. When I get time to fully finish them, I'll post the whole lot...! A general officer ceremonial variant on the lancer uniform would, frankly, be just ridiculously over-the-top, what with all the belts and cords and sashes and bullion embroidery and different coloured uniforms sections, not to mention aguillettes and gold trouser stripes! Utterly far too much and a classic case of "gilding the lily" if you ask me. ...it therefore sounds fabulous -- and I must have a go at drawing one of those...!! The only question is, which would be the base colours of the plastron and the tunic? Scarlet on blue or blue on scarlet...? Use both; one for general officers, the other for marshals/Royals. Alternatively, do a rough draft of both and see which is better looking. The whole thing puts me in mind of a something like a British equivalent of the old German rank / role of "General der Kavallerie." Obviously, there is also the very old Royal Household appointment of "The Master of the Horse" but that is a very distinct mediaeval position that used to have military significance but is now very much purely ceremonial (and has its own distinctive scarlet full dress uniform, now usually seen only at specific events like Trooping the Colour). I'll see what I can come up with but maybe it should wait until I've also been able to complete Hussars and Dragoons and we can compare which would work better (!). My idea behind requesting a general officer's lancer uniform, was of a royal or otherwise prominent general being appointed honorary colonel-in-chief of a regiment, thus being entitled to wear said regiment's uniform with general's insignia. One could also envision a flamboyant general privately commissioning a dress uniform in the pattern of his old regiment. Looking at the MoH uniform, I noticed that the insignia appears to be an outgrowth of the 1700s/early 1800s general rank insignia. When you're done the Hussar and Dragoons, you could always write the difference in uniforms as a reflection of the MoH's origins, if you pursue the MoH angle. Regular MoH would wear the current version (I don't know when that came to be instituted,) while members of the cavalry would get a regimental-appropriate uniform. Depending on how the MoH is appointed in your alternate universe, their could be royalty, peer, civilian, police, veteran, Army, RN, RAF, RM, etc. specific uniforms. Granted, RN or RAF MoH would be a little different, but it makes for a fun exercise. Glad you're here again! This is, after all, originally your thread so thank you for sparking all this off and letting me play with it -- look how it has grown...!! The British approach to Royal or other honorary Colonels or Colonels-in-Chief of regiments was always that, when on parade in that role, they would wear the uniform of the Regiment with the appropriate Colonel's insignia and accoutrements, regardless of their actual position or substantive rank. Thus Field Marshal the Lord Guthrie, as Colonel-in-Chief of The Life Guards, wears the uniform of a Life Guards field officer with Colonel's insignia when riding with the other regimental colonels for the Queen's Birthday Parade. That is partly why I included such variants for some of the designs in the previous posts. Now, having said all that, I'd still love to have a go at adding my General Officer-pattern collar and cuffs, with the bullion oak leaves, to the updated lancer uniform. I guess the role would be some sort of honorary appointment as the notional ceremonial head of all the Lancers. I guess that would then equally fit with something similar for Hussars and Dragoons -- when I finally get around to doing those...! That's why I was thinking of the German "General der Kavallerie" but in some sort of honorary capacity. It guess it would be the equivalent of the dark blue General's uniform I did a little while back for the Royal Artillery -- which, it occurs to me, could also be worn with Field Marshal's cap badge and rank insignia by the Sovereign in the rile of Captain-General of Artillery. An alternative idea is that you could use the Major-General commanding the Household Division as a parallel. Perhaps another general officer commanding an area which includes Lancers. Or even put a lancer unit under the household division. I guess the role would be some sort of honorary appointment as the notional ceremonial head of all the Lancers. I think this would be the same as the old french position of Colonel General. That's interesting, taking these titles with General of Cavalry as a starting point, you could have a head of each "arm" of the army who would be the head of a policy/doctrine/tactics development and also have a major part to play in procurement for their respective arms. Theoretically you could have one for each "arm". This is a list of possible arms with which to use this title. I have grouped some together as I assessed they wouldn't be large enough in isolation to warrant being its own "arm". You could have a different title for certain ones e.g. AGC could be Adjutant-General (which links in nicely in with itself), Medical Services could have a Surgeon-Genereal, I was toying with Bombardier-General for the Artillery but it could be a bit much. General Sir Peter Thorne, Colonel-General Cavalry and Armour, heads the Directorate of Cavalry and Armour which deals with the development and would be the ruling body for matters of policy and doctrine relating to his arm of the army. In this role he has a major part to play in procuring equipment for his arm or that shared with other arms. There would be similar directorates for the other arms. There is probably something similar already but this allows the General Lancer uniform and also a variety of others as well. On an army the scale of these days it wouldn't make sense to have these directorates but for an empire it could make sense. On what program did you make the shoulder boards and uniforms? The original designs are all done as object-oriented vector drawings in either Corel DRAW! or Adobe Illustrator. They are then exported and saved as JPG files for uploading to the web. I started out with Corel on my PC many, many years ago and I've progressively got more adept at using it over the last decade (or more...!). Now that my main desktop and notebook machines are Macs I'm trying to convert to using Illustrator but I'm finding it frustrating because I frequently know what I want to do (and know exactly how to achieve it with Corel) but can't work out how to go about it with Illustrator. I therefore end up getting out my old PC laptop and going back to Corel -- which is the main reason I still keep the PC! I guess I should just take the time to go on a proper user course for Illustrator! I'm away from home base for a few weeks so won't be able to do much more work on the drawings for a while as I won't be able to take the computers with me. Depending on whether I have decent Internet access (which is doubtful) I may not post much at all until I get back. I'll chip-in when I can. Thanks for that. I'll try downloading those two. Much more accurate and detailed Lancer uniforms. These are NCOs up to WO2 and show all six of the extant individual Lancer Regiments around the time in question. I've tried to keep as many of the historical and traditional elements and colours as possible but there are a few variations too. The badges have been standardised a little by including a standard pattern of crossed lances as the backgound element of all the cap badges. Those regiments with other traditional emblems have had these incorporated somewhere in the unit insignia such as collar badges or shoulder strap embroidery. The colours and patterns of the peaked dress caps broadly cover follow the traditional colours of the regiments, with a couple of notable changes: the 5th (Royal Irish) Lancers no longer have the Irish green plumes that would have been on their czapka helmets so, instead, the crowns of their caps are dark irish green instead of dark blue (and this also helps to distinguish them from the 9th (Queen's Royal) Lancers. The 5th also have matching green piping for collar and cuffs and it is also used as the backing for NCO chevrons. All regiments have the double yellow cavalry trouser stripes except the 17th who have white. 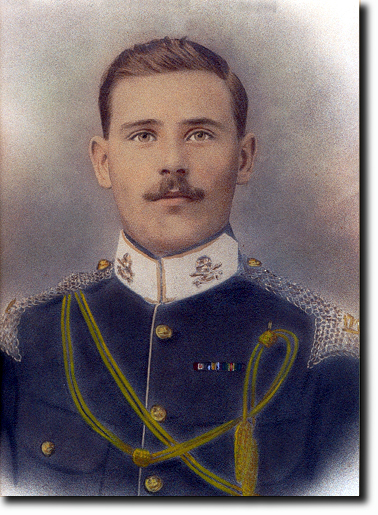 Note the WO2 (17th), has officer-pattern embroidered/bullion cap and collar badges and gold fittings to his uniform, including the longer officer-style cap cords over his right shoulder. The officer variants for these regiments and (hopefully) the other senior appointments we discussed in the previous posts will follow later when I have time.